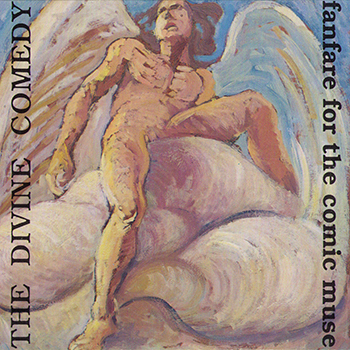 The Divine Comedy's very first album is also the only to have been recorded while TDC was still a real band. When the Active Studio demo was received by Keith Cullen at Setanta, he didn't like it; yet his girlfriend did and she insisted on him to give the band a try. They were signed to the label in January 1990 and recorded Fanfare in Easter. It was produced by John O'Neil, an ex-Undertones; yet Neil did most of the job: "It wasn't a particularly happy experience, none of my suggestions were taken on. Neil knew exactly what he wanted, he produced that album himself." The sound album was influenced by R.E.M. 's LP Eponymous. There doesn't seem to be any gathering theme between the songs. We can distinguish two sorts of songs (though there aren't any differences at listening): the Active songs, written in 1989 ('Ignorance Is Bliss', 'Tailspin' and 'Secret Garden'), and the rest, written later. Though Neil declares to have watched the film at the time he was working on Liberation and read the book afterwards, the title of the album is a reference to A Room With A View. Another evidence that Neil might have actually read the book before the recording of Fanfare, in 1989 actually, is the line "A worn out copy of A Room With A View" in the Active Studio version of 'Secret Garden'. As for the painting on the cover, we don't know who made it, nor whether it's an actual painting or something made for the purpose of the album.